Manual scoring is dealt with under this tab. eScoring is under the eScoring tab. Scoring Interface details are under the Scoring Interface tab. Entering time scores couldn't be easier. Type 630 to enter 6 mins 30 secs. Type 630.3 for 6 mins 30.3 secs. Type 630,3 for 6 mins 30,3 secs. See the Scoring Screens tab to see examples for each task. This is a completely up to date list of the best flight points across the whole competition. When clicked, the list also shows all the scoring elements (time, landing, height, ...). For F3K, the list is for the task currently being scored. Clicking on the 'Speaker' icon opens the Audio Player screen. Clicking on the 'Clock' icon opens the Digital Timer screen. Clicking on the 'Upload' icon opens the eScoring 'Upload to Server' screen. Clicking on the 'Download' icon opens the eScoring 'Download to PC' screen. Score Check button - brings up a screen to show scores that are outside of specified limits. Running Results button - preview or print a range of reports. The latest FAI rules (including provisional rules) can be found here under 'Sporting Code'. Watch the Score Entry video. 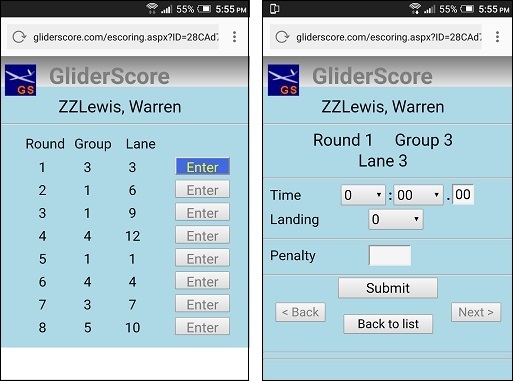 Scores can be entered (or viewed) for an individual pilot. "Goto Scores for selected Pilot" from the context menu. to enter scores where pilots hand in their scores at the end of the day. With F3K you are able to change the task for the round related to the current row. This will change all scores for the round according to the new task even though they cannot all be seen at this time. 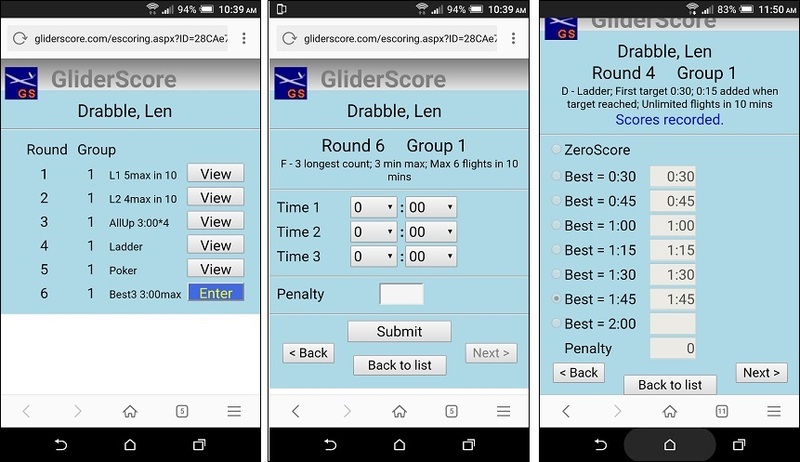 With multi-task competitions (F3B) you are able to select a pilot and then view and change the scores for that pilot. You can also change the selected task while still in individual pilot mode. "Goto Scores for selected Group" from the context menu. Watch the Score by Pilot video. A pilot can be moved to any group provided that the move will not create a frequency and/or team clash. This screen gives information about each group. 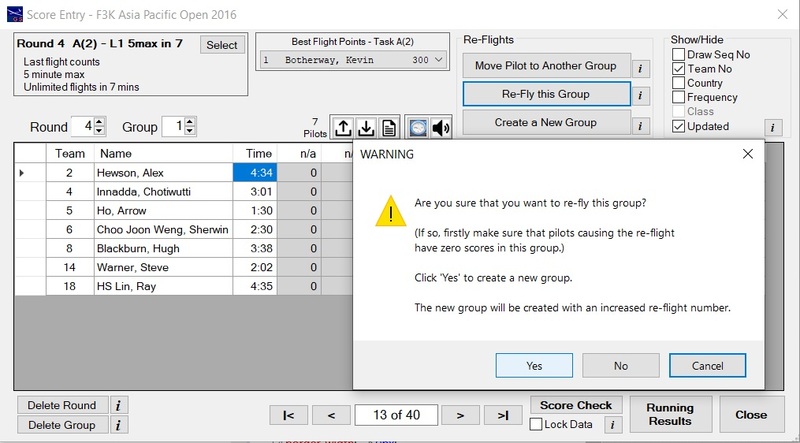 To make more groups available, options are provided to allow team clashes and to ignore or change the pilot's frequency. Watch the Move Pilot video. An entire group can be re-flown. 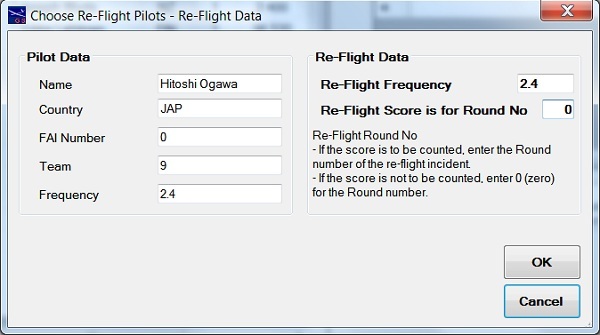 Make sure that the pilots entitled only to the re-flight score are given a zero score in the original group. The program cannot check for this. A new group with a re-flight number one greater (than the original re-flight number) will be created. Pilots will be credited with their best score out of all of their flights for the round. Watch the Re-Fly Group video. A completely new group can be built. This would normally be made up of pilots who are entitled to a re-flight, but can include other pilots as well. 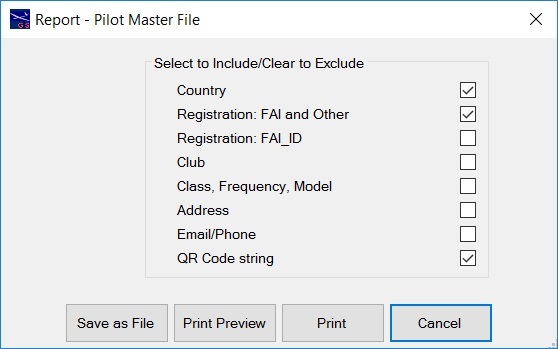 Pilots can be specifically chosen or they can be randomly chosen for you by the program by clicking the 'Randomly Select a Pilot' button. The new group will have a group number one higher than the highest group number for the round. Pilots will be credited with their best score out of all of their flights for the round. For more details see below. Pilots can be re-flown in any round up to the current round. 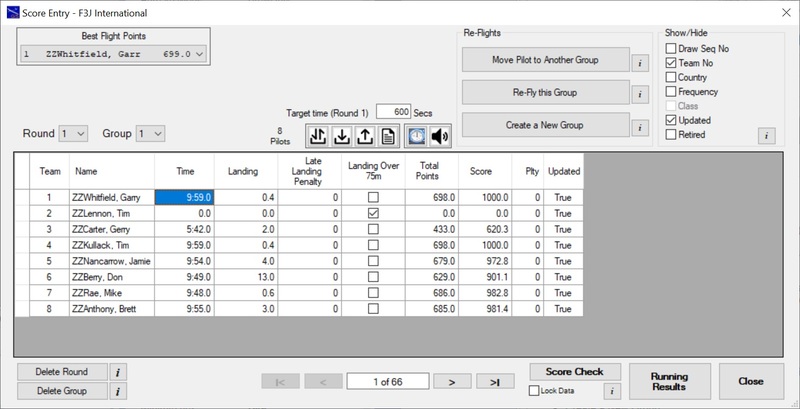 Re-flight scores are applied to the round specified for each pilot. The round specified must be the round in which their re-flight incident occurred. 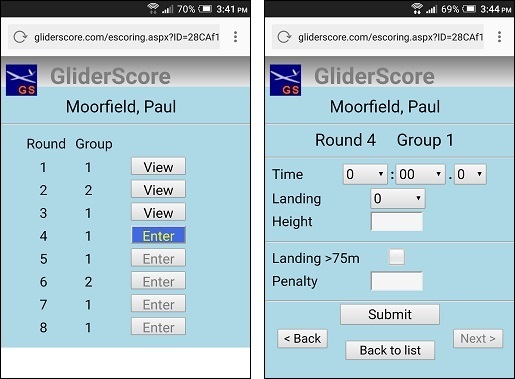 GliderScore can optionally ignore a re-flight score for any pilot added to the re-flight group to make up the numbers. In this case, when adding the pilot to the group, enter 0 (zero) as the Round number. This indicates that the score is to be ignored in the results. 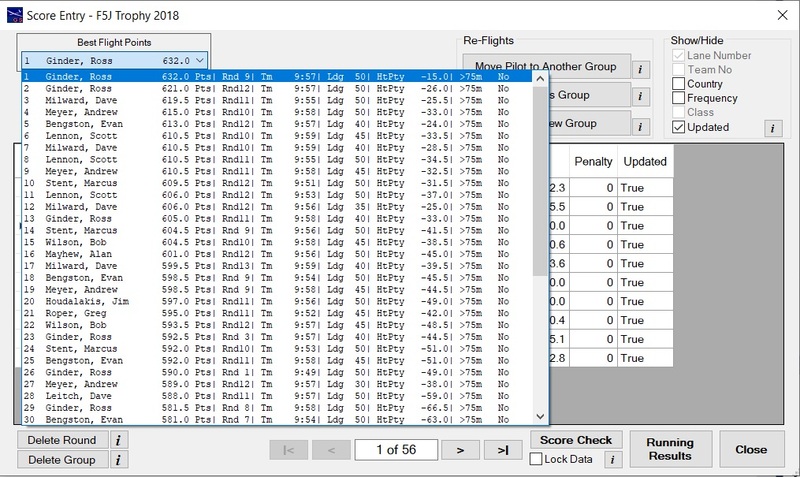 Scores that are ignored appear with a line through them in the Flight Scores report. If an actual round number is entered then the pilot will be given the best score out of all flights having that round number. Watch the Create New Group video. The buttons for splitting groups are towards the bottom left of the screen and are only available for Speed and F5B. Splitting groups is for cases where a round cannot be completed in consistent conditions and to continue would be unfair to the remaining pilots. Groups are always split into two, but these groups can be split again if desired. Each group is scored separately. Watch the Split Group video. If a number of pilots retire from the competition, the result can be that some groups are left with very few pilots. The answer is to take the following steps. Go to the Pilot Entry screen and mark these pilots as Retired. Save these changes. Pilots who have retired can later be un-retired, and put back into the draw. Watch the Retire Pilot video. Duration target time can be changed for any round if desired. For eScoring, these are the screens that you will see. Left image - choose the task and then the round for viewing or entering scores. 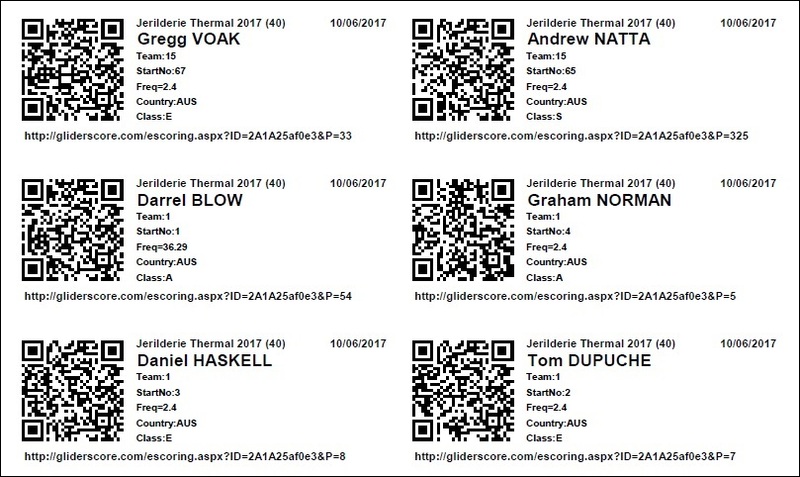 Right image - the score entry screen for the thermal duration task. 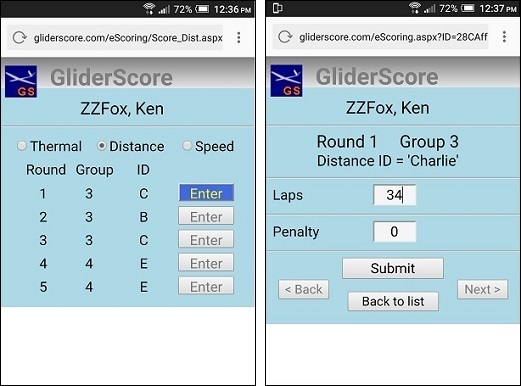 For eScoring, this is the score entry screen for the distance task. The draw order can be manually changed in the Scoring screen (after the draw is made). 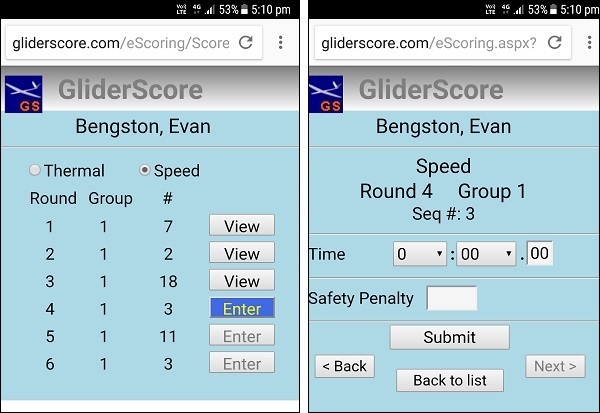 For eScoring, this is the score entry screen for the speed task. For eScoring, this is the score entry screen for the F3F class. 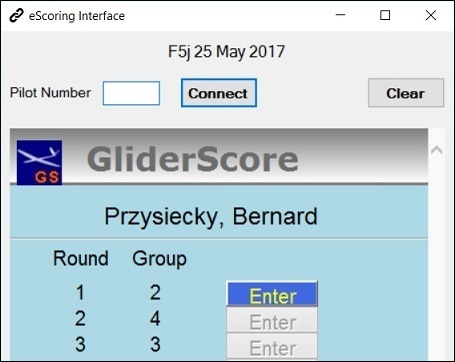 For eScoring, this is the score entry screen for the F3J class. Scores can be keyed in manually if desired. For eScoring, these are score entry screens for the F3K class. For eScoring, these are score entry screens for the F3Q Duration task. 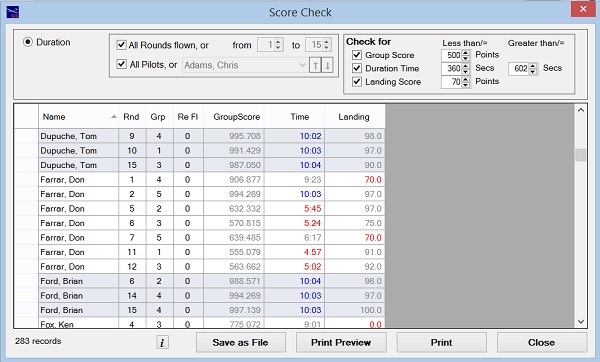 For eScoring, these are score entry screens for the F3Q Speed task. Time (or times) for the duration segment. For eScoring, use only one timekeeper. For the F3RES Class, the eScoring screen looks like this. This gives the total of 803 points. For eScoring, these are score entry screens for the F5B class. Under F5J rules it is not practically possible to achieve the full target flight time. However, overflying the target flight time means loss of all landing bonus points. 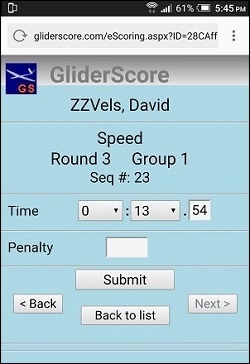 From Version 6.52 GliderScore will not allow entry of a flight time that is equal to or greater than the target time. If a pilot overflies the target time, the scorer must make sure that no landing points are awarded. If a time or landing is entered for a pilot, the progam ensures that a height is also entered. 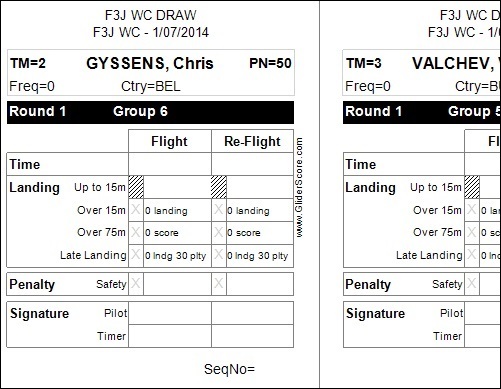 For eScoring, these are score entry screens for the F5J class. Unlike F3J, there is no column for a Late Landing penalty. 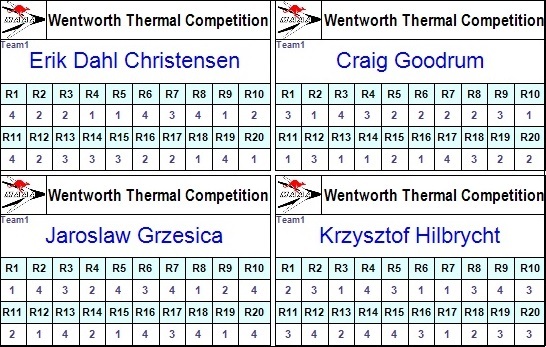 For eScoring, these are score entry screens for a Thermal Duration competition. Unlike F5B, there is no column for Laps. For eScoring, these are score entry screens for an Electric Thermal Duration competition. 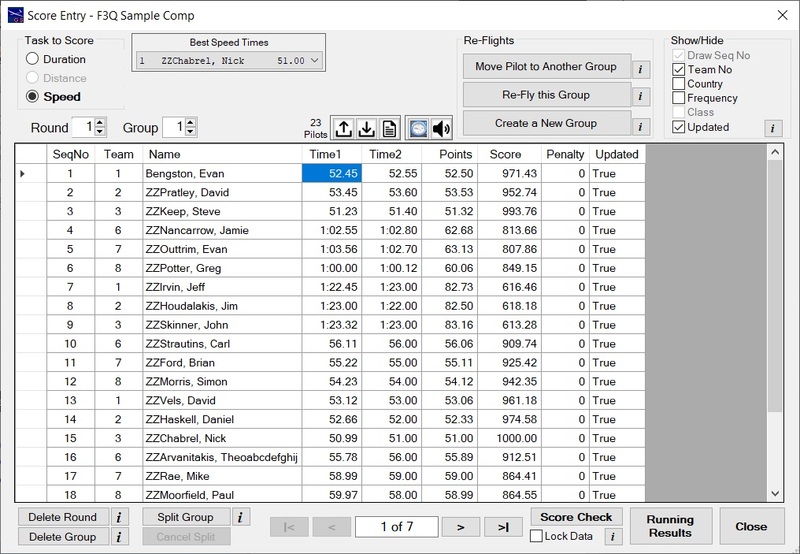 In this example, GroupScore based on Time has been selected. From the Reports Menu you can produce score sheets similar to this one. 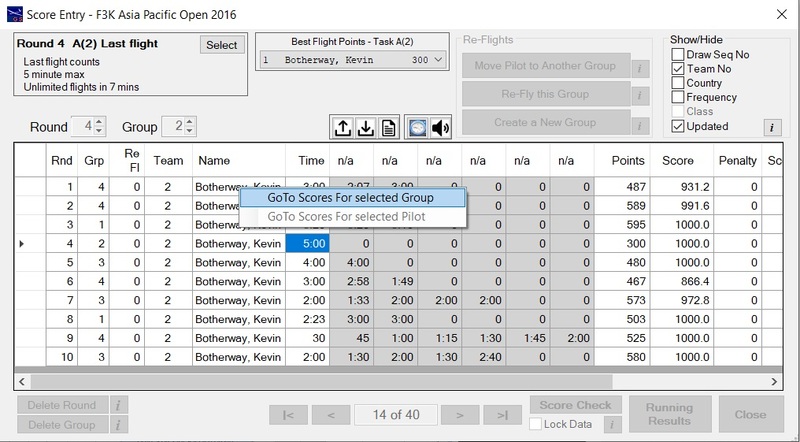 Score sheets are specific to each task and have exactly the columns needed to record the flight details as required for entry into the Scoring screen. Pilots are listed in exactly the same order as they appear on the Scoring screen. From the Reports Menu you can print score cards similar to these. Both blank and pre-filled score cards can be printed for all duration tasks. See the Draw Rounds → Score Cards tab for more details. It is also possible to have QR Encoded Score Cards. 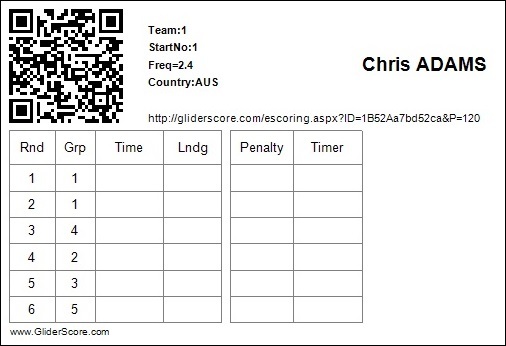 Click here to see QRCoded Score Cards. From the Reports Menu → Score Record you can print Score Record cards similar to these. The Record cards can be printed for all duration tasks (except F3K). The Record cards are in a standard format that allows pilots to keep a record of their flight scores. They can be used to check against the scores that are entered. The Record cards are 'pre-filled' and will show round and group numbers if the draw has been completed. 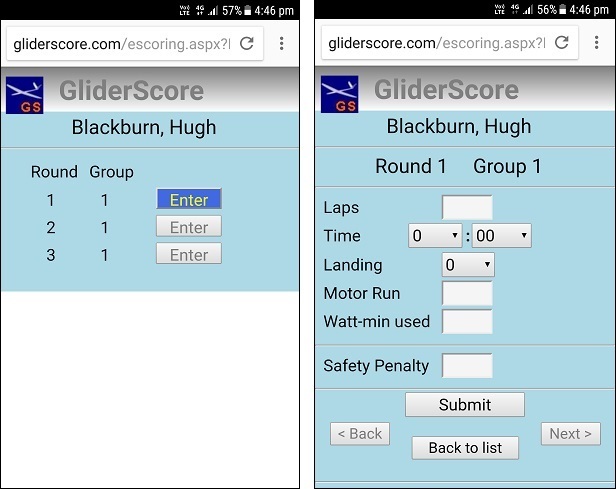 If the Score Record is printed after scores have been entered, the Score Record will show the scores for each flight together with the normalised score. Print a separate badge for each pilot. Each badge has a table showing, for each round of the draw, the pilot's flight group. The badges are sized so that they easily slip into a holder similar to a name badge holder. The badges print 10 on each A4 page. Up to 24 rounds can be printed per badge. From the Reports Menu you can print a QR Code List similar to this one. Scanning the QR Code with a smartphone establishes connection to the eScoring system. 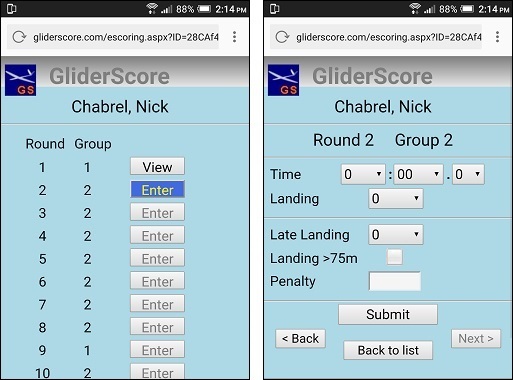 Always use the latest version of GliderScore for eScoring. 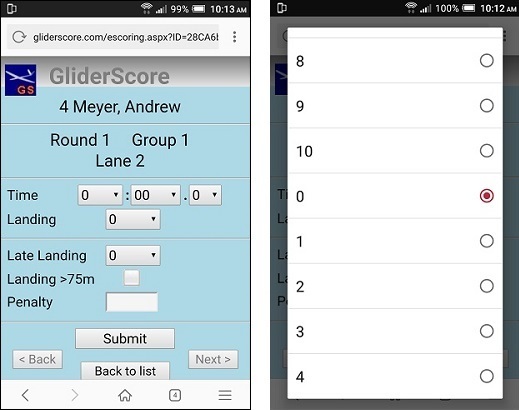 GliderScore provides for remote score input by smartphone. Here is a short video contributed by Mike Vos that explains eScoring very well. The competition is created on the PC. Data is sent from the PC to the GliderScore server. 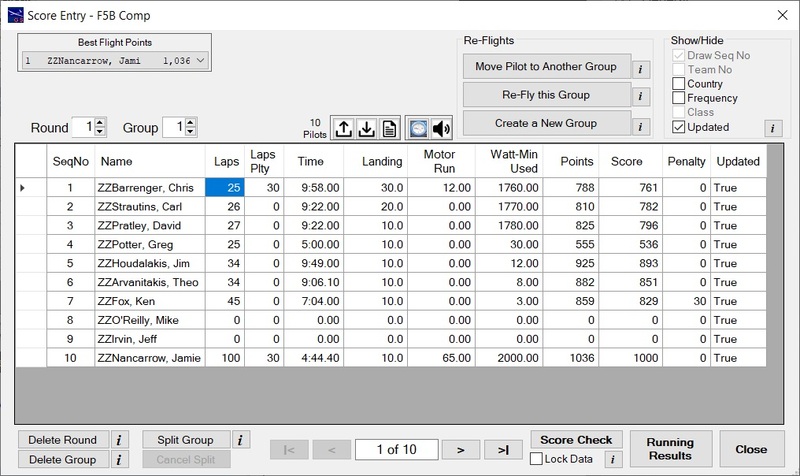 Pilots access their data from the server and enter scores. When a pilot taps 'Submit', their score is sent to the server. The scorekeeper downloads scores from the server to the PC. When all scores are in for a round, the scorekeeper re-uploads the data. This puts up-to-date results onto the server. 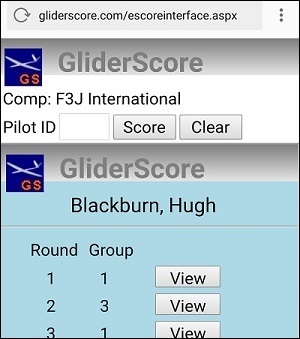 The pilots can now see their current ranking and scores. There is no direct connection between the PC and the phones. The PC sends to the GliderScore server and receives from the GliderScore server. 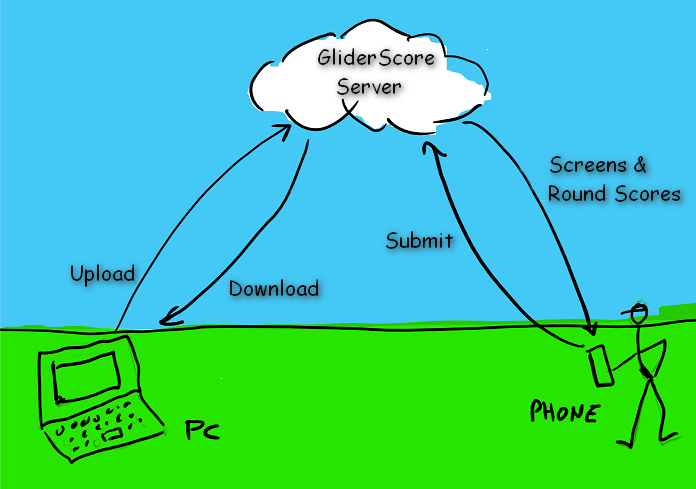 The phones send to the GliderScore server and receive from the GliderScore server. Reduced chance of errors from poor writing. The QRCode has to be scanned only once. Pilots/officials can enter scores at the landing spots. Memory lapse errors are eliminated. No more time wasting trips along the flight line to submit scores. Fewer delays from gathering scores. Entry is quick and easy. Built in checks to ensure validity. Can continue with manual scoring if all else fails. 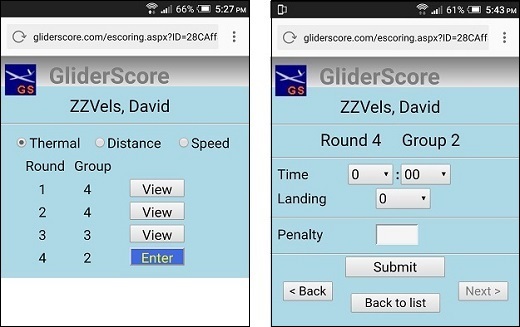 Pilots can review their scores on their phones. Available for all glider competitions. As organiser, you will take these steps. More details in following tabs. Make sure that the flying field has good mobile/cell phone coverage. If coverage is poor for some ISPs, you might have to establish a wifi hotspot. Create the competition and the draw as usual. Make sure that all the scoring parameters are set correctly. These parameters will be uploaded. Make sure that the QRCode Setup is correct for eScoring. Print the Score Record cards. These provide a QRCode that, when scanned, connects pilot to the server. Upload the data to the server. Download scores once the competition gets under way. Go to the For Organisers tab for more detailed information. Bring a smartphone to the competition. The phone must have a QRCode scanning app installed. - QR Droid is very good. - You can use the built in feature of the iPhone camera. - Chrome for IOS sounds good. handling multiple pilots on the one phone very easy. - Opera Mini for IOS sounds good. It also has a built in QR scanner (button is in the address bar). Scan the QRCode that is on your Score Record. This logs you in to the server and loads your master scoring page in your web browser. 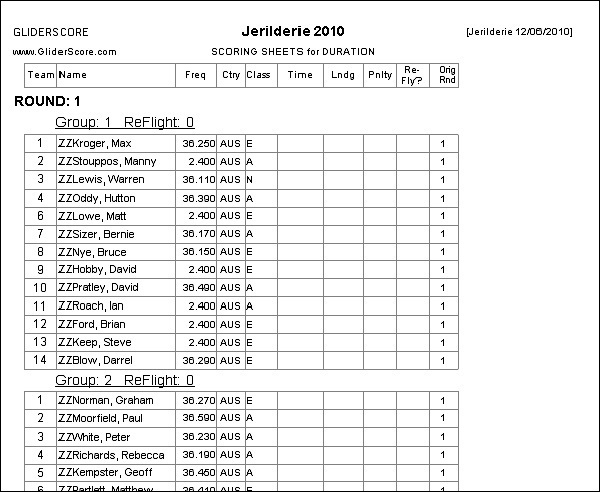 This web page takes you to an individual scoring page for each flight. Write your score details on your Score Record. Enter your scores on the phone and press 'Submit'. Go to the For Pilots tab for more detailed information. Here is everything that you need to know as an organiser. before taking the next steps. These are uploaded! To create a backup system. The easiest way to do this is to make a copy of the entire C:\GliderScore6 folder on a USB stick. If the main computer fails, use the USB stick to copy the entire C:\GliderScore6 folder to another PC. 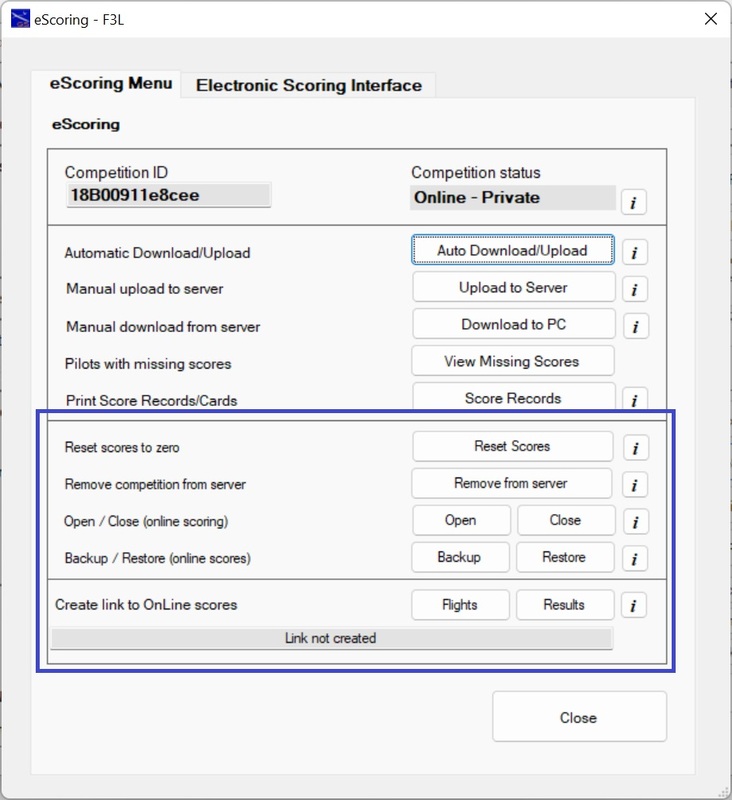 Then open the competition and download all scores from the server. You cannot create a backup system by exporting the competition and importing to another PC. On import, the competition gets a new Competition ID and will not work with the data on the server. and start again. This will totally refresh his data from the server. These are the steps before uploading. Of course the draw needs to have been completed in its final form. Set the timing decimal places. Set the group score decimal places. Set the landing table to be used. This data is all uploaded and is needed by the system. Click on the 'Upload Data' tab after you have finished reading this page. Access this QRCode Setup screen from the Main Menu. Click on the green 'Reset for eScoring' button. It never has to be done again. Click on the 'Score Records' button. You can also print the 'Score Records' from the eScoring page. You can also check on the QRCode Setup here. The columns that print depend on your competition setup. The URL encoded in the QRCode is written out in full. You can type this into a browser window and it will all work. The Score Records will print four to a page for up to 10 rounds drawn. The print will be two to a page if more than 10 rounds are drawn. The Score Records are now ready to be handed out to pilots. You can upload data as many times as it takes to get the right data on to the server. You can re-upload after downloading scores. The data from scores entered will also be re-uploaded. You might want to re-upload if scores have been changed on the PC after downloading. This will make the scores on the server identical to the official scores on the PC. You cannot re-upload data if there are scores on the server that have not been downloaded. That would risk loss of data. These un-downloaded scores must be downloaded first. Each competition has a unique CompID code. This keeps every competition separate on the server. 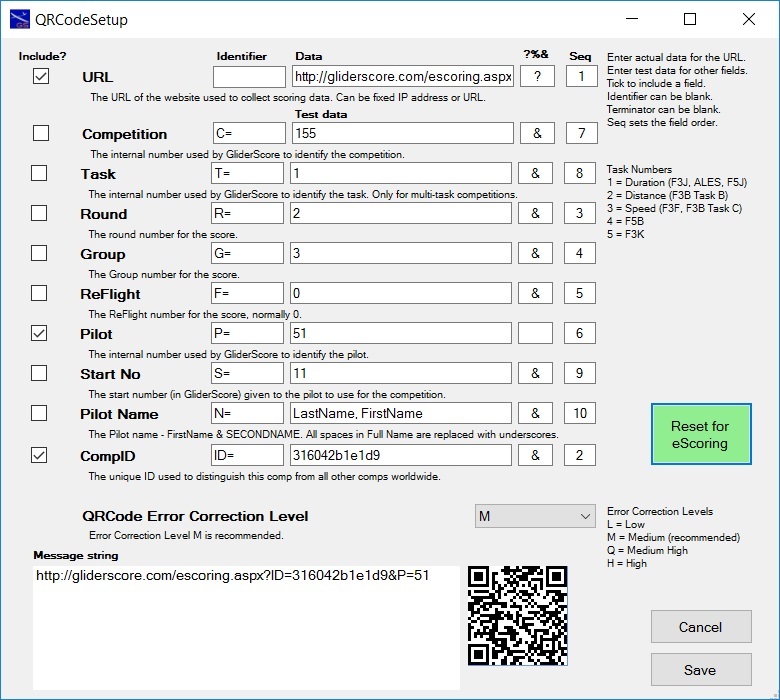 The QRCode encodes the website URL, the CompID and the (GliderScore internal) pilot number. With this data, the system is able to find everything it needs on the server. Click on the 'Upload to Server' button. You will be able to select a range of rounds to upload. Normally this will be for all rounds. website, make the Competition Status = Public when uploading. You can change the Competition Status by uploading with a different Status. The upload is much more that just the draw. also uploaded for validation purposes. This includes the landing table. It is highly recommended to use a landing table with no more than 50 line entries. 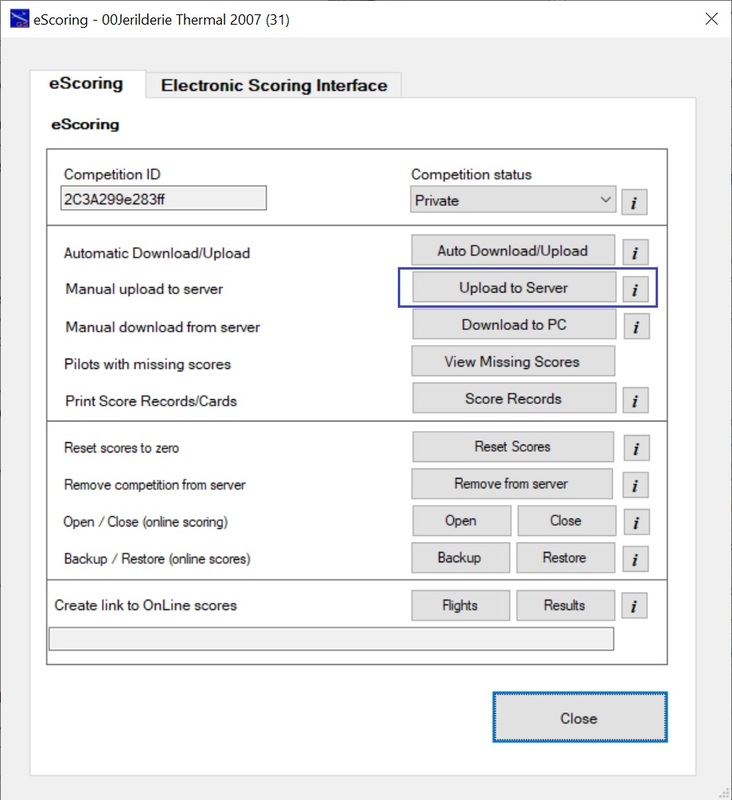 Click the Upload icon in the Scoring screen to upload data. Very useful when posting progressive results at the end of each round. You can perform most functions without ever leaving the Scoring screen. until changed in the eScoring screen. Click on the 'Download to PC' tab after you have read this page. Download data as frequently as you like. even if the data has been downloaded before. The data downloaded will not overwrite any scores on the PC. Manually entered and amended scores are protected from change. All scores can be manually changed on the PC in case of error. It is much quicker if you only download one or two rounds at a time. You can download from two places in the system. We will look at both further down the page. - Scores are automatically re-calculated. 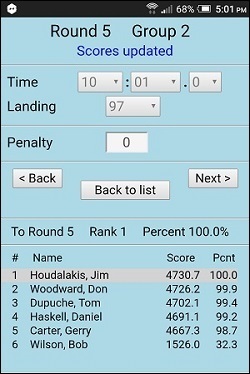 - A screen showing pilots with missing scores will appear. You should pay special attention to this screen. expected record on the PC. There is a special screen for that. Click on the 'Upload Scores' tab for more vital information. Click on the 'Download to PC' button. You will be able to select a range of rounds to download. The download process will start. Click on the 'Download' icon. There is a new column called 'Updated'. system. Otherwise, a value of 'False'. to 'True' and back again. 'Show/Hide Columns → Updated' checkbox is ticked. Remember that scores are automatically calculated after download. When you have ALL the scores for a round it is time to upload them to the server. That way they are available to all pilots. The upload to server procedure is exactly the same as before. The only difference is that the data now contains official score information. It is best to upload regularly. After the upload of scores, the pilots will be able to see results like this. Notice that the blue text at the top shows 'Scores updated'. Before the upload, this would have been 'Score recorded'. Click on the 'For Pilots' tab after you have read this page. As the organiser, you can always input scores on the PC. The system will never overwrite these scores. Pilots always input their scores using the same screen, but there are three ways to access that screen. This is very suitable where a number of pilots share one device. Scanning the QR Code on the Score Card is well described in other places. and does not involve the organisers to provide any resources other than the Score Cards. You can set up a separate computer (connected to the internet) for pilots who do not have smartphones. 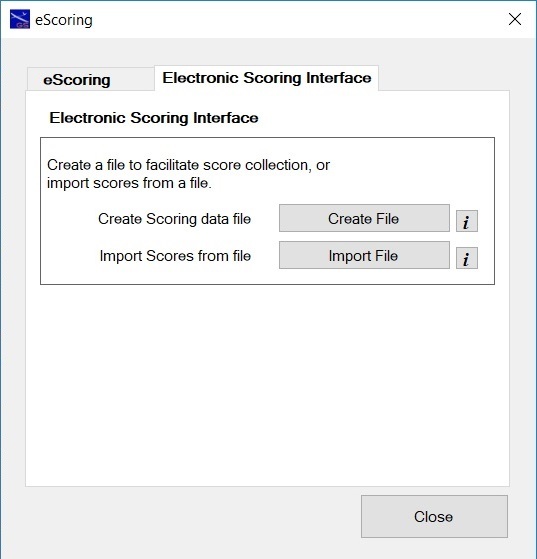 Pilots will be able to enter their scores by using a small program called eScoringInterface.exe. This program can run on any internet-connected PC. It does not need GliderScore on the PC. It can be in any folder. eScoringInterface.exe is available for download by clicking this button. Running eScoringInterface.exe brings up this screen. Key in a name for your competition and the CompID. The CompID can be found on the Score Record cards. Click on 'Open User Form' to see this screen. he would if using a smartphone. the screen, ready for the next person. Closing this form closes the program. This method can be used for any internet connected device, including a PC. You will then have this screen where you can enter any Pilot ID. The Pilot ID is the number at the end of the QR Code string on the Score Record. Press on 'Score' to get the pilot's scoring screen. and go ahead and enter scores. Enter another Pilot ID to see their scoring screen. Pilots need a smartphone with a QRCode scanning app installed. Those without a smartphone can use a 'communal' computer (see below). I have found QRDroid to be excellent on Android. For iPhone/iPad, the built in scanner should work. Otherwise Quick Scan is worth trying. There is no other software required provided the phone has a web browser installed. 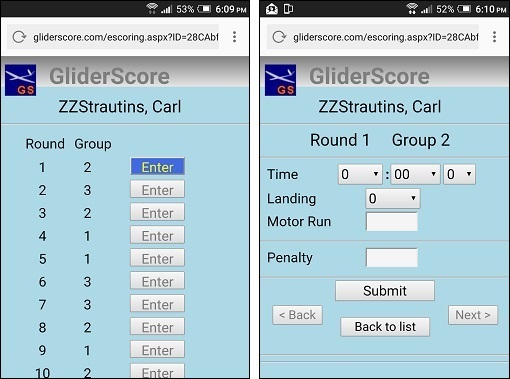 Pilots also need their Score Record with their QRCode. When the pilot scans the QRCode, it takes him to a web page like this. The pilot can see exactly when he is drawn to fly. - For F3K, the task is shown against each round. - For F3B Distance, the ID is shown. - For F3B, F3F and F3Q Speed, the flying order is shown. - Where Lanes are used, the Lane is shown. 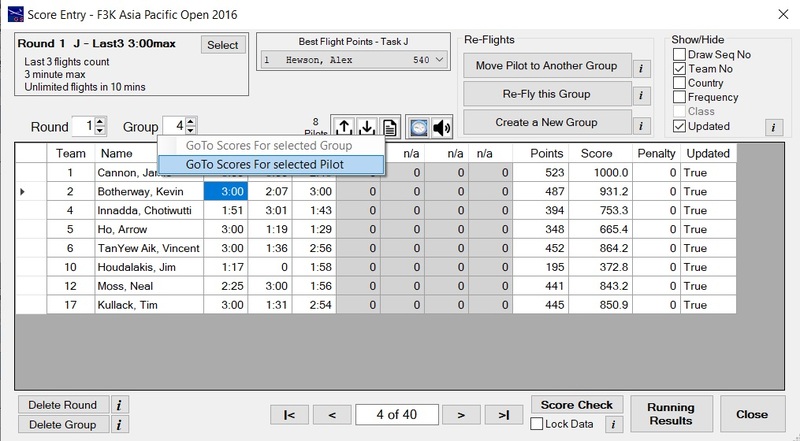 Only one flight group is open for score entry. the next one will become available. Pressing the 'Enter' button takes the pilot to the score entry screen. There are separate screens designed for each competition type. With F3J there will be a 'Late Landing' box. With F5J there will be a 'Height Penalty' box. F3K, F5B and others all have their own special screens. When the pilot scans the QRCode, it takes him to a web page like this one (on the left). This page is for F3J. There are dropdown boxes for minutes, seconds, landing and late landing. dropdown boxes scroll both ways. So, if you want a high value, pull down. double list of possible values. You can enter a zero score with this form. confirm by pressing Submit again. This will record the zero score. the previous score entry page. the next score entry page. The Back and Next button are enabled or disabled depending on circumstances. It is suitable when several pilots share the same device. 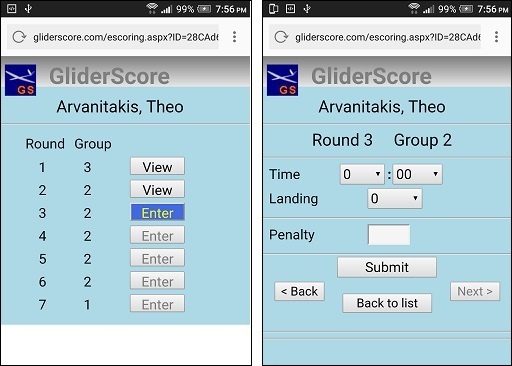 After entering scores for a round, the scoring screen for the next round becomes available. You can View scores for previous rounds or Enter scores for the next round. The right hand image is the score entry form for Task D.
One tap fills in all the scores up to the button tapped. Details of the pilot's flight group are always available. 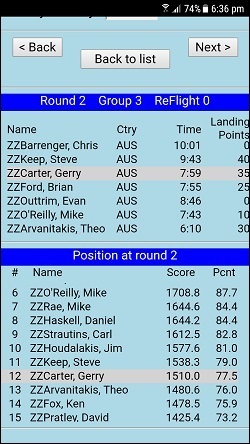 Initially all flight group pilot scores are zero. As scores are submitted, a refresh of this screen will show the submitted scores. The system also shows the Points total at this stage. Normally, at the end of scoring for a round the CD will upload results to the server. 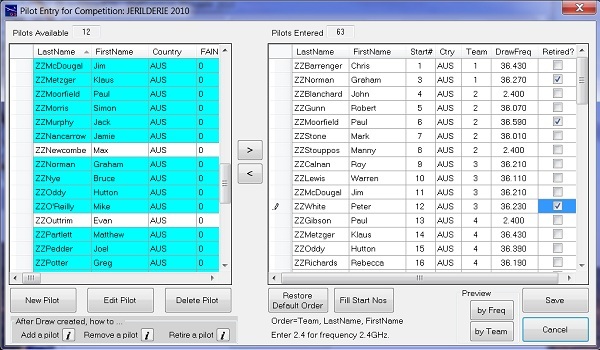 This updates the flight group data with the normalized scores and the progressive position of every pilot. 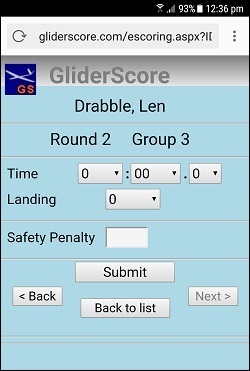 Allows control of exactly when pilots can and cannot enter scores. Close online scoring at the end of the day's flying. 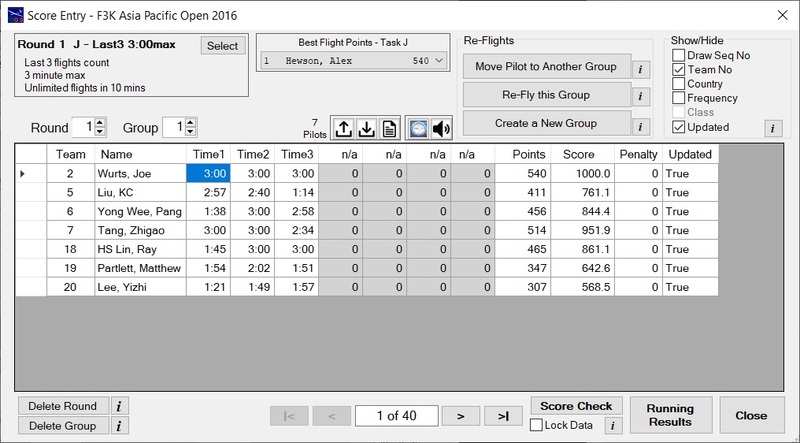 Open online scoring at the start of the next day's flying. 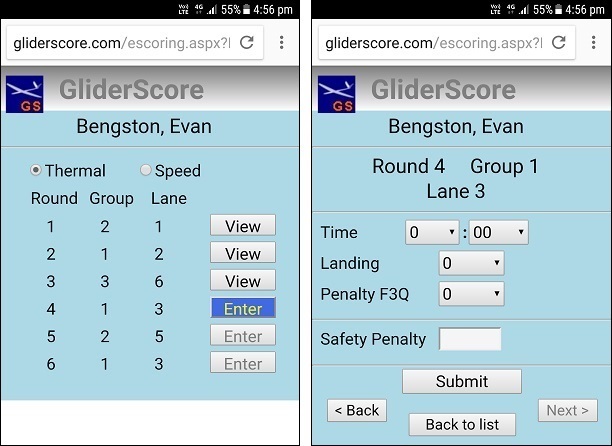 When clicked, allows score entry by mobile 'phone to proceed as normal. When clicked, prevents score entry by mobile 'phone. This can be for the whole competition. for entering the real scores. particular round and group to the end of the competition. This may be needed if pilots enter scores overnight by mistake. 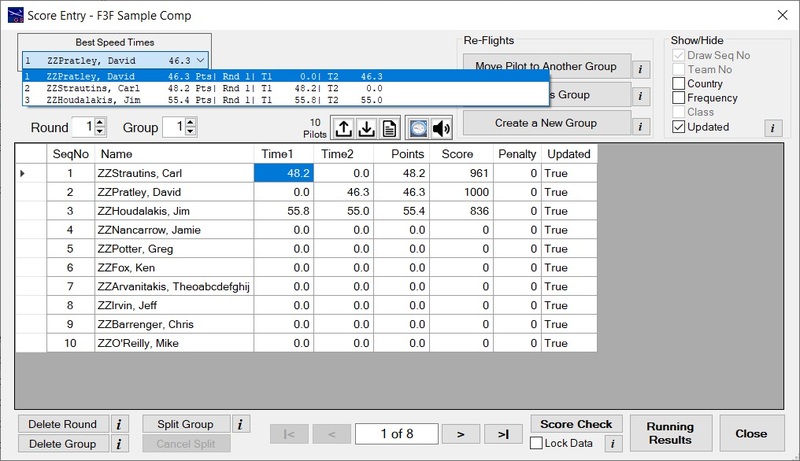 Create a backup copy of ALL score data for the competition. will be asked to confirm before overwriting it. Backup data can be restored to the main data table at any time. All data in the main data table will be replaced with the backup data. 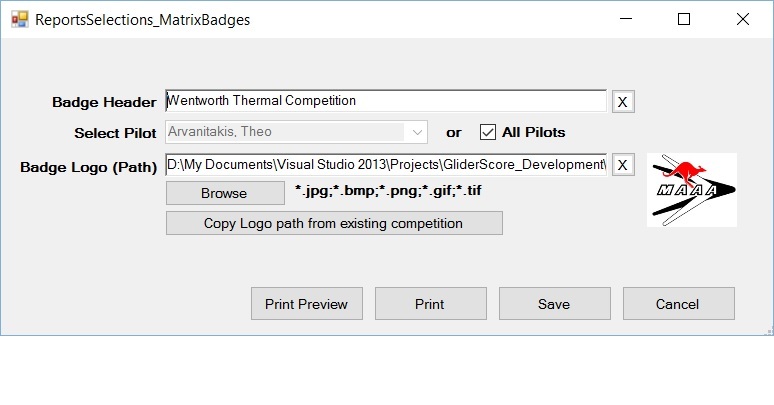 A full list of pilots in the competition and their eScoring URLs is available from the Reports Menu. Reports → Pilot Reports → Pilot Master File. With this report you can select to print or download the eScoring URL (QR Code String) as shown below. This module in GliderScore came about after it was suggested to me by Jim Monaco. getting the project started would have been much more difficult. has put into it has been enormous. are due to their suggestions. scores to be opened for scoring. Thanks Marcus. The person who is to be thanked the most however is my wife, Helen. nothing other than sit at the computer and beaver away at the project. So thank you my darling. lesson materials on all aspects of programming. web application. I now know a lot more, but still very little really. Without these people who willingly share their knowledge this would never have been finished. Thank you Microsoft. Without your generosity this would not have happened. 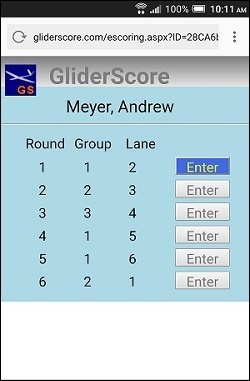 GliderScore provides assistance to those wanting to create electronic score collection software. 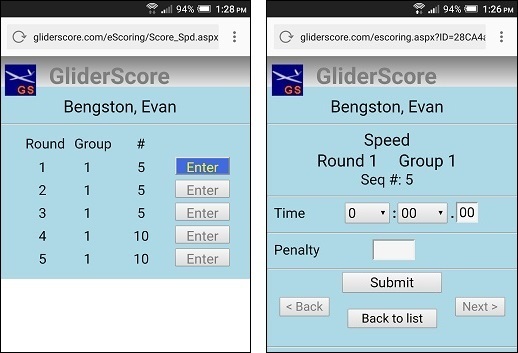 The ability to download the Scoring data to a file. This file can then be uploaded into the score collection database. 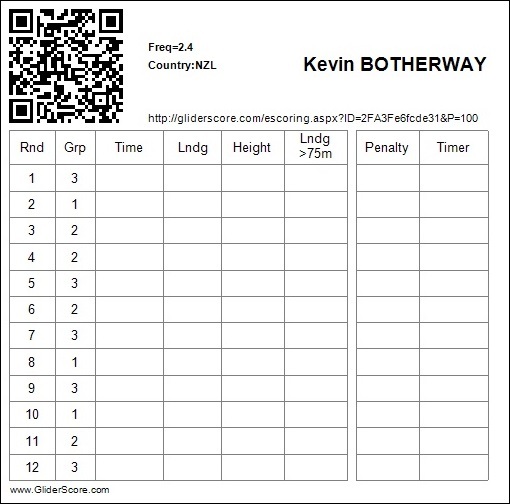 The ability to print score cards with QRCodes. The QRCodes provide a way to identify where to put the scores being collected. The ability to upload scores from a delimited file. 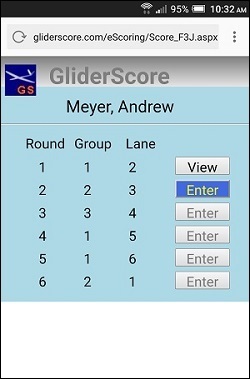 The scores collected can be imported into GliderScore from a .csv file created from the score collection database. All scoring calculations are done as a part of the same process. Click on the 'eScoring' button to open this screen. The second tab is 'Electronic Scoring Interface'. Choose the location and file name for the downloaded data. There are 15 fields in the data file. 6 key fields, 8 data fields and 1 Name field. The key fields contain the data needed to identify the scoring row. The data fields are used to save the collected scoring data. The pilot name field contains the pilot name to make the file human friendly. The following table shows where the scoring data has to go. For F3K, record as many times as required for the task. All other times should be zero (0). *FlightTime2 only applies where there are two timekeepers and both times are to be recorded. Otherwise make this field zero (0). Flight times are formatted as mmss.ddd (or mmss,ddd where the decimal symbol is a comma). 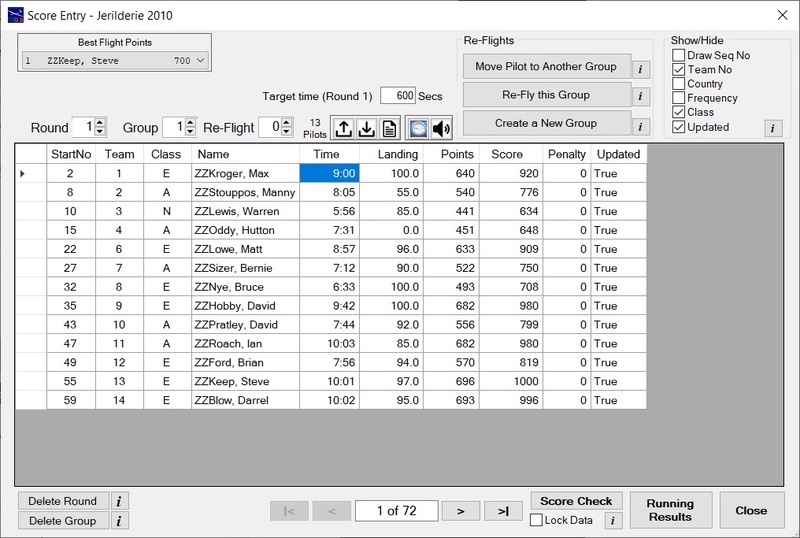 Landing values must be values from the (Distance column) of the Landing table being used for the competition. It is recommended that a Landing table where both Distance and Points are the same be used. In this case, mark the landing tape with the landing score, and collect that value. Select the .csv file that you updated by browsing to it's location. A number of data validation checks are then carried out. The import will be cancelled if any of these fail, and an error report will be produced. Once the import is completed a full re-calculation of all scores is carried out. Remember that any existing data will be overwritten by the imported data. The Score Check button appears on both the Competition Setup screen and on the Scoring screen. Clicking this button brings up the screen shown at right. that may have data entry errors. Red - equal to or below lower limit. Blue - equal to or greater than upper limit. Grey - value is within limits. Group scores that are very low (or zero). Duration times that are very low or unusually high. Landing scores that are very low. Laps flown (F3B Distance) that are very low or very high. Speed times (F3B or F3F) that are very low or very high. Motor Run times that are very low or very high. Start heights (F5J) that are very low or very high. The items that can be set depend on the type of competition that is being checked. Un-check any item that is of no interest. By un-checking 'All Pilots', it is possible to quickly cycle through each pilot in turn by clicking on the up and down arrows. Individual rounds can be isolated in a similar way. 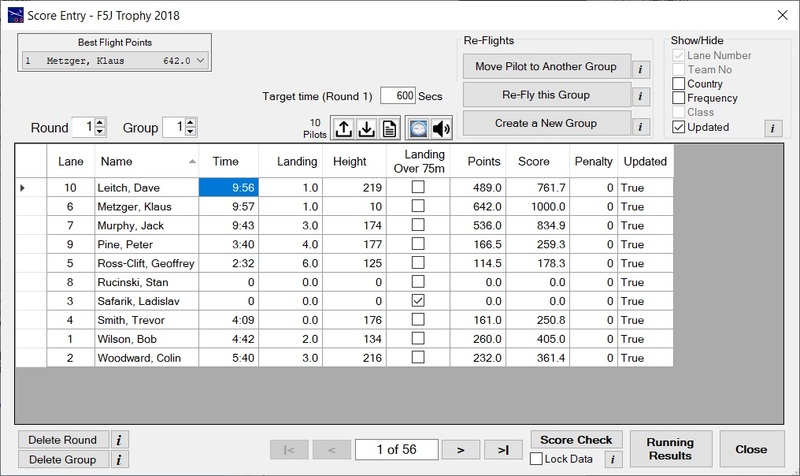 The Best Flights list is available on the Scoring screen. Click on the drop down box to expand the list. Click anywhere to close the list. The list shows points scored in order from best to worst. 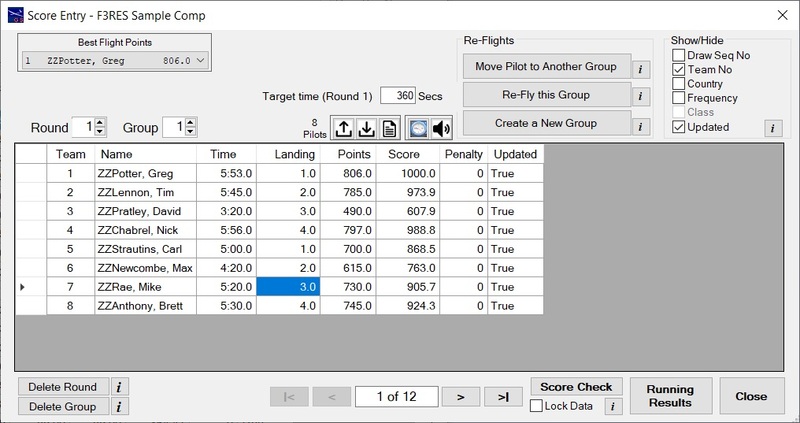 It also shows the flight score elements that went into the points scores. By default the best 50 points scores are listed but the complete list can be shown by clicking on the last entry. The list is instantly updated whenever a score is entered or changed. For multi-task competitions (F3B, F3Q) the list covers the task being scored. The list is for the F3K task being scored, but covers that task for the whole competition.